Pierre Asselin : Yes, describe what you see. Madame B. : Okay as a yoyo exactly. How should I say ? A form, not an oval, but a rounded oval, more rounded on both sides put. Pierre Asselin : As a "donut without the hole in the middle" ? Madame B. : Yes, yes, absolutely as I saw it aside to rise, [but] I could not see if there was a hole or no hole [transverse to the UFO center]. But the form of "donut", it's more common sense. Pierre Asselin : You only see the side while ? Madame B. : Yes, next to. It was the morning, sunny, then, behind me, there was is. 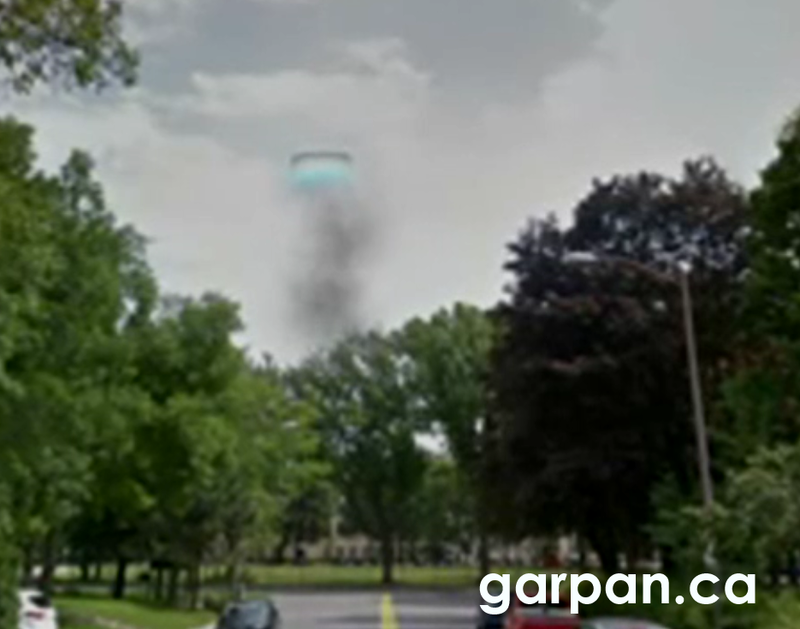 This « case-is » [UFO] was obviously informed, but she was brighter below. It was brighter than the sun that is light. It was very white-blue, très incandescent. Also, there was like a small gray smoke[and]-black[and] between that [UFO] and the ground for it [l’ovni s’é]rose. So me, I was on the ground in front [College] Merici. 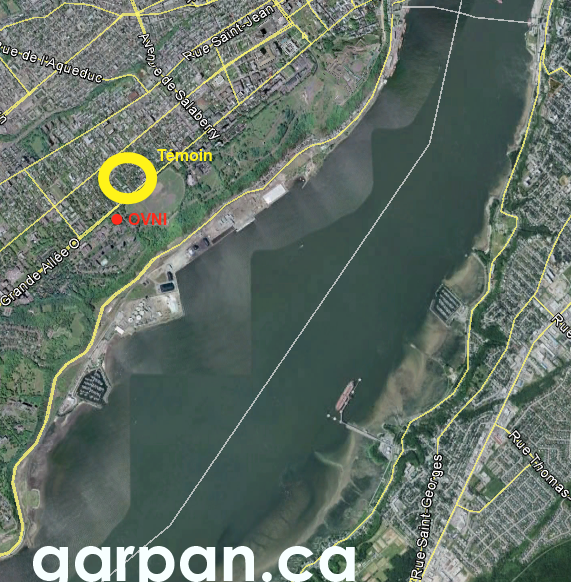 [At that time,] it was not [land] while blocks of apartments Mérici, de condos, there was just College Merici. So me, who had been resident there, [during] seven or eight years, I thought : "Here [therefore], it is in their forward field ! ». 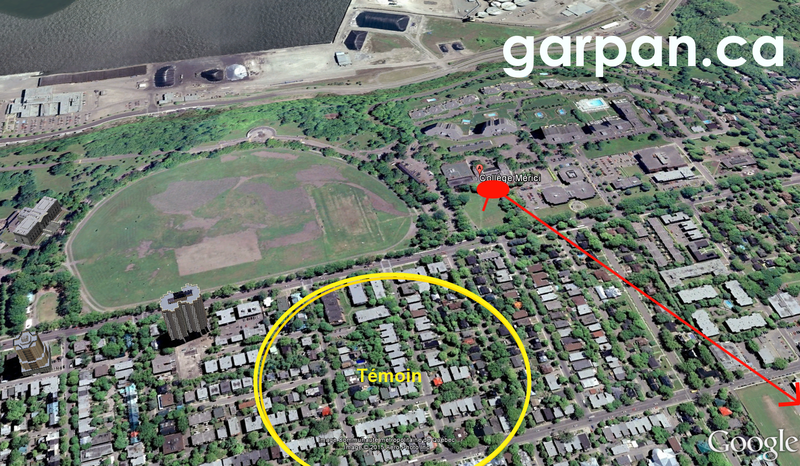 There was a large field between here [that place] and the [boulevard] Grande-Allée. Reverse against, when [UFO] did [product] a small black smoke below, it was informed many, very, very, vivid below. Then, to [a] time, it stopped. There was little more than smoke, or anything, and it [UFO] has had a certain height. Here for example, with a snap, it began to evolve by going west, west-north. Pierre Asselin : At the horizontal ? Madame B. : At this time horizontal. Pierre Asselin : It was placed horizontally. In [a] time, that [UFO] stopped up and there was more smoke below. And then, it seems to me that there were ... - I do not know if there was still white lighting below, bright white. There were electrical son who passed [in my field of vision], so it was [= The UFO was located] from the last [in] the bottom and the next [above]. When it's spinning [away] to disappear, as it was still at the same point : it shrank, it shrank, it shrank, Then I saw it spinning [away]. Pierre Asselin : Ayoye ! What color was ? Pierre Asselin : The UFO was there the metal air ? It was round and clear ? Madame B. : It was dark on top, as I said earlier. Top up a little towards the sides, following a little borough, but not much. It was mostly below [that c & rsquo; was] brighter, but when it has gone spinning, ça the disparu [= After smoke extinction, Brightness was less important, and then it went away until it disappears]. Brightness, I do not know if there was [during takeoff], because, like that dwarfed, I saw less. Then, that eventually [n’]nothing could be completely. Pierre Asselin : Ah bon ! Madame B. : And then, is, although I had a young baby. I called my husband who was trying to shave. I did not want to leave my observation point, then let the baby to go to the bathroom to tell my husband to come and see. I was afraid of losing [view], so I stayed there, while saying from time to time to my husband : «One, one, one ! ». Then the little maid [housewife] I had also [was there], but it was not made in the kitchen, so she did not come, I was in the kitchen. Pierre Asselin : Yes, with triangulation, one is able to judge distances and dimensions. Madame B. : Someone doing a little math, I think it could [reconstruct the trajectory and the approximate size of the UFO]. Although I thought coudonc, it had interested me much and I had a good mind to take the car and go see. I thought : "If it's in the field Mérici, en avant, surely as the grass will be burned, it must seem, there must be something. ». Pierre Asselin : It lasted how long at all ? Madame B. : Oh Mr. !… One minute, a minute and a half ... Count it [such an event], it is difficult to assess. It rose, it rose slowly, but not for long. Wait a bit. Two, three minutes. Two, three minutes, [for as long as] mounting [= Climb of the UFO] then [that] Early smoke [escapes]… The small smoke stop [just to escape] before it [UFO] take the edge of [en s’enfuyant] to the horizontal. I would say two minutes or three minutes maybe, I had the time to call my husband several times. Pierre Asselin : When you called the airport, What you were told ? Madame B. : You're disais : "If they have them other observation ? ». They told me that no one else had reported them something, "... So we will take a note. ». [Then,] I started looking in the neighborhood. I thought : "Military, the aviation museum, then all that ... maybe ... ". I called, then they told me : « Oh, not, nobody told us about it. ». I said : "Note it anyway, sometimes [someone would know]. ». I do not know if they noticed or what. This is the two "things" [= Organizations] I warned. Pierre Asselin : The interview we just did here. I will not write an article with this, but I will send your testimony to the people who collect such data. Madame B. : Yes, it's good. Pierre Asselin : You do not mind ? Pierre Asselin : At least, like that, it'll stay. It will stay traces of your observation. Madame B. : Sometimes, we can say that it is the fruit of imagination, but I am very skeptical to all sorts of things. I'm not paid to go see feature films, d’extra-terrestres, then it all. I'm not paid to follow this kind of films, not. J’ai d’autres domaines moi, mes intérêts. Quoique les reportages à propos des choses dans l’atmosphère, dans le cosmos, then it all, je trouve ça très intéressant. Des scientifiques qui ont des réunions, puis qui font des découvertes, je trouve ça intéressant. Pierre Asselin : Est-ce que cet événement vous a influencé par la suite ? Est-ce que votre opinion a évolué à ce sujet ? Madame B. : Yes, j’ai peut-être été plus aux aguets, plus portée à observer si quelque chose a l’air un peu louche ou quoi. Pierre Asselin : Yes, ah bon ! Bien c’était très intéressant, I'm glad that someone has called me after my recent article. Madame B. : Although there, I am an old lady. At this moment, [in 1966,] I had like forty years, now I have four to twenty. 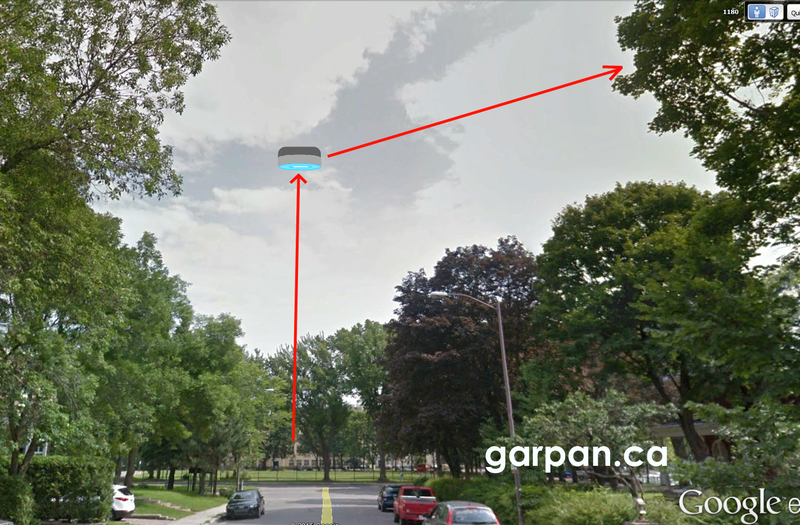 The witness described here where stood the UFO before clear off to the northwest. Here you can see all the alertness of this lady from 80 years. In that case, investigators have a year to determine the length, mais M. Asselin has not applied during this interview. We believe that " 2-3 minutes "are not consistent with the evidence and the observation has probably lasted less than two minutes.